Official annual long life puja offered to Lama Zopa Rinpoche at Kopan Monastery, Nepal, December 29, 2012. We Welcome a New Study Group! Lama Zopa Rinpoche is about to begin a private retreat in Taiwan before beginning a teaching tour in Asia (details below). Lama Zopa Rinpoche and Tenzin Ösel Hita after lunch together, Kopan Monastery, Nepal, December 2012. 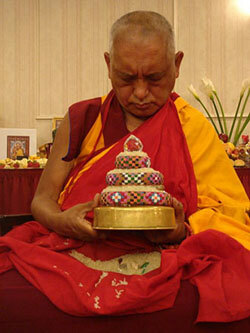 Lama Zopa Rinpoche offering a mandala in Pennsylvania, USA, July 2008. Imagine a world where our teachers live long, healthy lives; where we have the resources needed to accomplish all of our virtuous goals; where we are able to support thousands of Sangha engaging in beneficial activity on auspicious days of the year. This is precisely the aim of the FPMT Puja Fund. 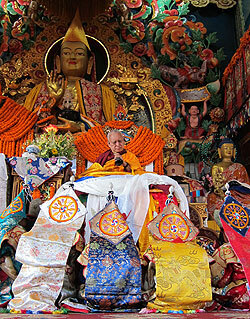 Monthly and annual pujas, offerings, prayers and practices are sponsored by this fund, under the direction of Lama Zopa Rinpoche, and dedicated to the long life of His Holiness the Dalai Lama and to the success of all the FPMT centers, projects, services, students, benefactors and those serving the organization in any way. The annual cost of this fund is currently estimated at US$45,000. The FPMT Puja Fund is scheduled to sponsor an incredible array of auspicious activities this Losar (February 2013) when the merit created is multiplied 100 million times. You can contribute to these incredible offerings and share the wealth of merit created by donating any amount! Holy Objects, Mantras, Prayers and Practices and an updated Sutras page. New Retreat Program! As a result of Lama Zopa Rinpoche’s expressed wish for FPMT students to actualize the lam-rim, especially to attain shiné (calm abiding) and bodhichitta, we are pleased to announce a new retreat program being developed in conjunction with Vajrapani Institute, to be held March 16 – 30, 2013. We hope that these retreats will become an annual event designed to encourage and support keen meditators to advance in their meditation practice. We are very happy that Ven. René Feusi, a highly experienced meditator and skillful guide, has agreed to lead the first retreat of this new program! Please visit the Vajrapani Institute website for more information. New Basic Program Online Course! A new subject for Basic Program Online, Mahayana Mind Training – Wheel of Sharp Weapons is now available. The course is available from the FPMT Foundation Store or to Friends of FPMT at the Dharma Supporter and Patron levels. Did you know that every issue of Mandala offers new stories and interviews online to supplement our print edition? As part of our new January-March 2013 online edition, we’ve collected contributions from a dozen of Geshe Lhundup Sopa’s students, celebrating their precious teacher and the publication of his autobiography Like a Waking Dream. Plus don’t miss a new interview with Geshe Thubten Sherab; a story from Mexico on the Movement for Peace and Justice with Dignity; and photo galleries of FPMT’s activities in Nepal and His Holiness the Dalai Lama’s visit to Kurukulla Center. Visit fpmt.org/mandala for these stories and much more! Lama Zopa Rinpoche with the incarnation of Bakula Rinpoche, who the other monks say is very shy but extremely intelligent, Drepung Monastery, India, December 2012. Did you know that your center can advertise any retreats via the FPMT website? This is a service designed to help students find the retreat they need wherever it is being offered in the world. For Discovering Buddhism retreats, contact Tom Truty. For all other retreats (must be four days or longer), contact Claire Isitt. We strongly encourage each FPMT center, project and service to make regular donations to the FPMT Puja Fund (see above) as these pujas provide amazing spiritual support for your work. The Foundation Store is offering FPMT centers, projects and services a 40% discount on The Preliminary Practice of Dorje Khadro. The burning puja to Dorje Khadro (Vajradaka) is one of the nine preliminary practices (ngöndro) of the Gelug school of Tibetan Buddhism. 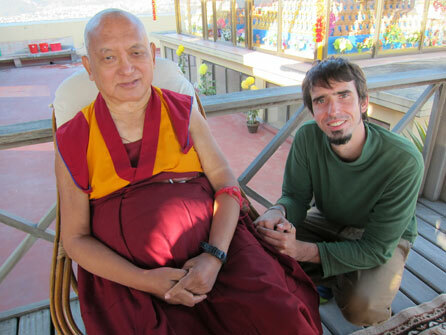 Lama Zopa Rinpoche with Chombey, India, November 2012. In Buxa Duar, when Chombey was a monk, he was the one who pushed Rinpoche to meet Lama Yeshe, introduced Rinpoche to Lama and made the request for Lama to teach Rinpoche. Chombey later disrobed and became the main cook at Kopan Monastery. Please join us in welcoming another new study group (probationary center) in Italy. Available to watch! A beautiful video made by Matteo Passigato of the long life puja offered to Lama Zopa Rinpoche in Bodhgaya, India in January 2012, offered by FPMT and all the monks of Sera Je Monastery and Kopan Monastery. Ganden Yiga Chözin Buddhist Meditation Centre in Pokhara, Nepal needs an FPMT-registered resident teacher; Karuna Hospice Services, Australia is looking for a CEO; Milarepa Center in Vermont, USA is looking for a part-time spiritual program coordinator; and Root Institute in Bodhgaya, India needs a center manager and school manager.